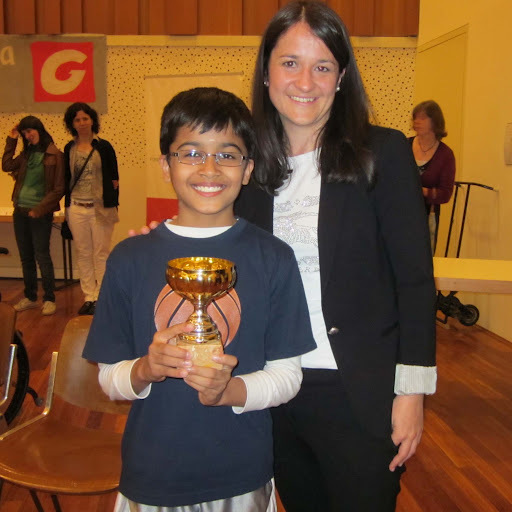 Our next tournament in June was Server 24 Chess in Ortisei – St. Ulrich. 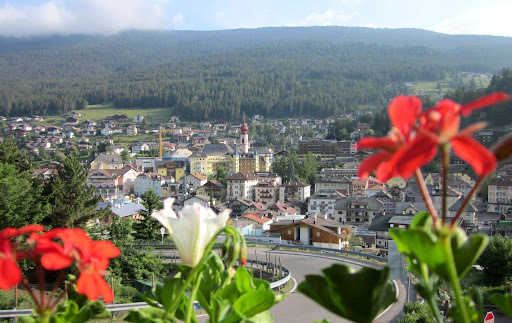 Ortisei is a beautiful small township nestled in a high valley and surrounded by mountains. A green emerald guarded by glistening and rugged peaks with long snow fingers. It’s no Brochure picture. I took it. I was there! 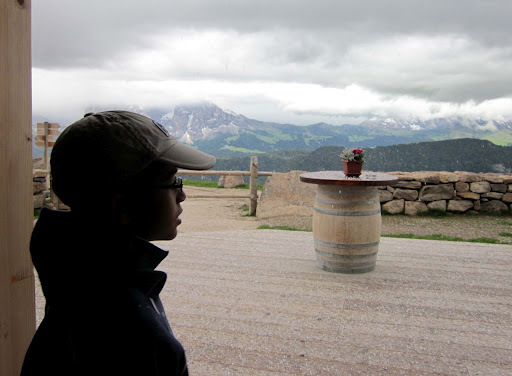 Ortisei sits at an elevation of about 1300 meters. 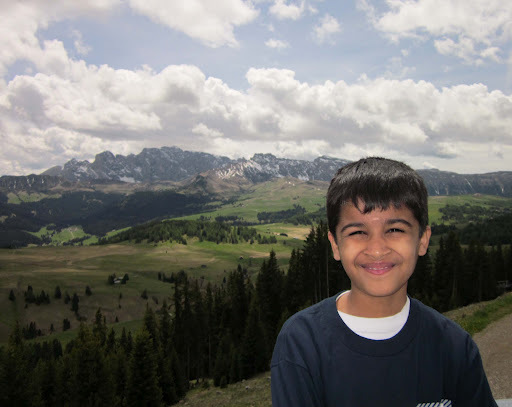 Surprisingly, the weather was warm and pleasant. We were expecting this to be coldest point of our Italian journey and had packed warm clothes. Well, the weather in the mountains can change fairly fast as we discovered and it did turn fairly cold on some evenings. In fact, as you will see we ended up experiencing warm sunny weather to cold weather, to even freezing rain and snow when we went up the mountains. Looking out from the balcony of our hotel room, which was wedged into the side of the mountain was a truly fantastic experience! Such lush greenery rising on the slopes all the way to the top. 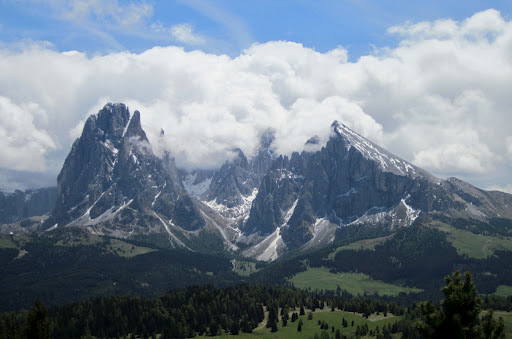 Then there were high, rugged brown Dolomite mountain range with snow-capped peaks and their snowy fingers snaking down. During the night, the twinkling lights of the city lit up the valley. There were many a evenings we spent on the balcony eating our dinner and enjoying the peaceful scenery. 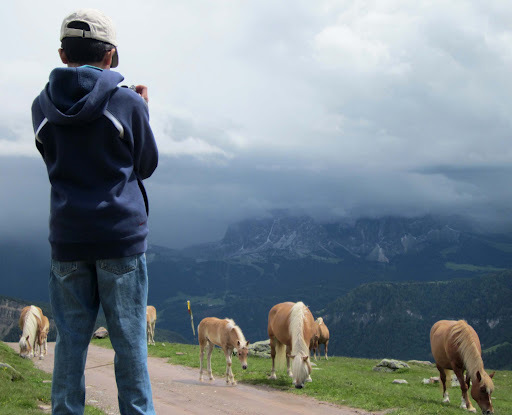 Ortisei and the broader region of Val Gardena are huge tourist attractions due to their scenic beauty. As a result, most of the buildings are hotels run by generations of families. What left us in a huff-and-puff was the walking around. As the city rises along the slopes, there is a lot of walking-up one has to do. Since the city is on an elevation, walking around can be exhausting since most paths are steep, but walking down isn’t a problem as usual :). We just walked around the city for the rest of the afternoon, getting comfortable with the place. I loved the fact that there were lot of pizzeria’s, and what better place to have pizza then in Italy! Another thing striking about Val Gardena is its culture of wood carving. 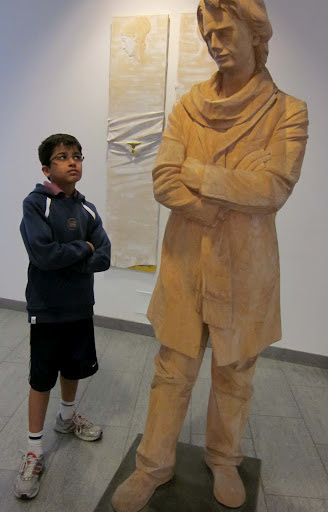 The carvings are real masterpieces and wood seems to appear like clay in the hands of these artisians. This spirit of Val Gardena was captured in the unique trophy. 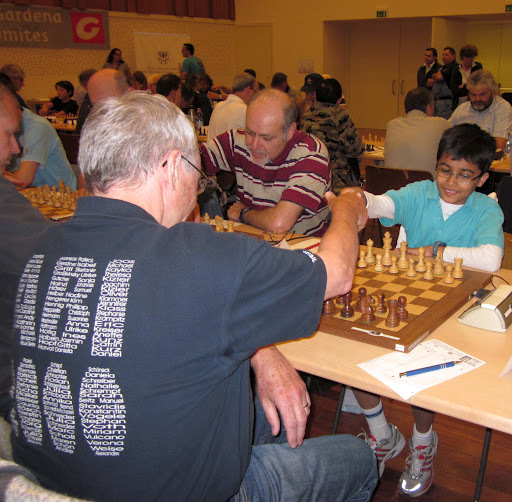 Moving on to the Chess tournament, it was much bigger than the previous one I played, and there were many GM’s and IM’s. 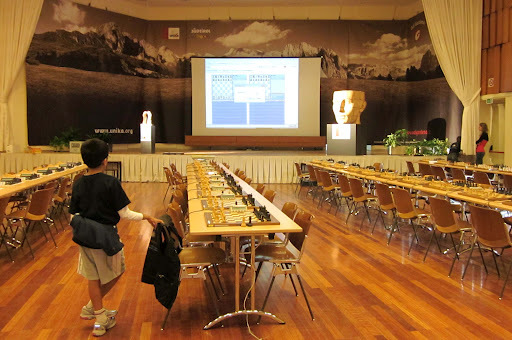 The chess tournament venue was fantastic – it was the hall at the Cultural Center in Ortisei, and on display throughout was a “smaller” replica of a famous head carving of a project called “Movement.” The real one is about 20ft high. The playing Hall with “Woody” our giant head friend. The first round I was paired with a GM. Maybe it was time to continue where I left off with GM Naumkin! Unfortunately it didn’t work out that way, and I played a rather weak game, missing chances to equalize and played kind of uninspiringly. The following round I was paired with a 2051, who played in a manner which my chess coach refers to as “bunker chess” – openings which give the opponent an indisputable advantage, but with no real weaknesses to play on. After improving my pieces I went for a Kingside attack. But I had managed my time so poorly that when I was about to make the decisive breakthrough I was rushed into making a poor move which nearly lost the game for me. The opponent was a bit worried about playing me further, and he offered a Draw which I accepted. The key thing was not to push any further and recognizing the position on the board was not the best for me at that time. I didn’t spend too much time worrying that the opponent was lower rated to me – a lesson from the past. 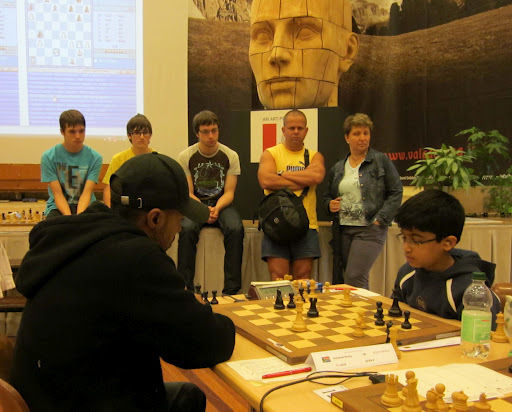 Round 5 had me paired with one of the organizers of the chess tournament. He was also rated 2150 and very experienced. It was an interesting game where he secured an advantage but then misplayed. At that point I became a pawn up. Later on I discovered that I also missed a quicker win. As the game continued, I managed to bog him down further. Just when I thought I was winning a clear exchange with a fork, I overlooked that he could save his rooks by swinging one over to the King-side and threatening mate! Luckily for me, my experienced opponent was in time pressure and he misplayed allowing me to finally close it out. 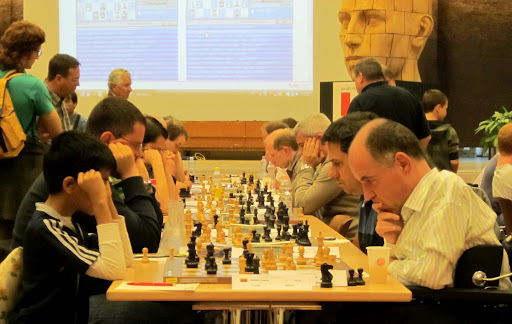 A long tiring chess game which could have been shorter if I hadn’t missed the elementary Qa5! Also, I would suspect that it must have been fatiguing for my opponent to both play and be involved in daily organizing-related activities. 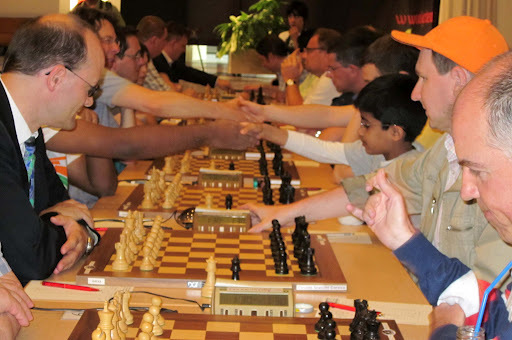 In the sixth round I had another chance to play a titled player – an IM rated 2420. I liked an idea I found during the game and I developed a good position without much problem. However, in hindsight, I made an idiotic decision by opening up a good position. The chess board became favorable for him as my knights turned fairly clumsy and awkwardly positioned, while his pieces could coordinate much faster. I was again in time pressure and so I set a little trick. The trap was that if he takes my Pawn with his Knight, I have the amazing Rh8, which would win the game. Play teetered on and he became Pawn up, but I still had chances. He then made a mistake and I had a brilliant opportunity to Draw. Rh8!! Something that we see in chess studies. Elementary! Once again, I missed it. But that wasn’t the end of the game. We went into a rook endgame. It should have been a Draw with correct play. I defended accurately till a point, until I slipped in time pressure. There were far too many lines to calculate in limited time. It was sad since I was playing well but losing in tenable games. In round 7 I was paired with a 1972 rated player Guilio Simeone, and I lucked out after he missed a strong continuation (as Guilio pointed out in the comments section). From there on I got the initiative and won fairly comfortably. The penultimate round was with a titled player again – an FM with a 2370 rating. Another chance to create some upsets. The opponent made a very dubious push in the pawn center and I immediately grabbed the upper hand. I was Pawn up and just had to get my queen side pawns rolling to close it out. I moved c4 expecting him to set up some sort of blockade on the dark squares. But to my amazement he played b5?? hanging a piece. I responded with c5! which wins his Bishop and from there on it was just a matter of technique, and finally a win!. The Final Round now! 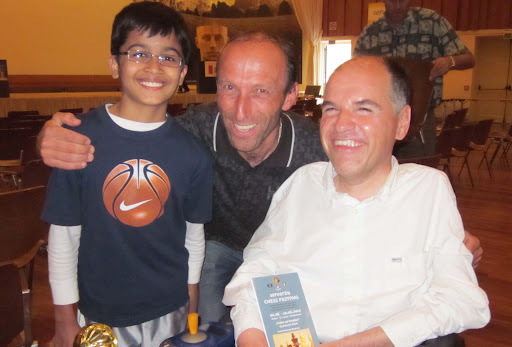 I played with IM Kenny Solomon (2429) who was the highest rated chess player from his country – South Africa. I found some accurate middle-game moves which gave me an advantage. Kenny got into significant time pressure and from there on I just kept playing moves which forced him to make erroneous decisions. When we both made the additional 30-minute time control, the situation stood like this – we both had a Rook, a Bishop, and a Knight. But I was two pawns up. Carefully I proceeded forward and gradually converted my material advantage into a delightful win against a strong chess player. 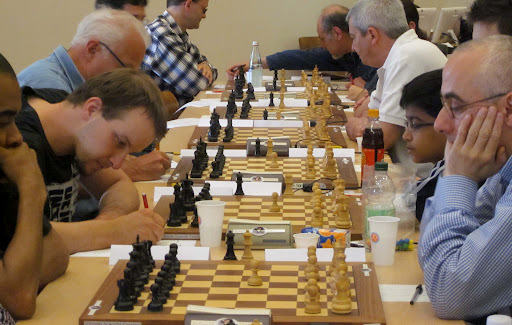 I finished the tournament with 5.5/9, and performing above my rating level. It was a very nice way to cap off the tournament and a good sign that something big was coming…. 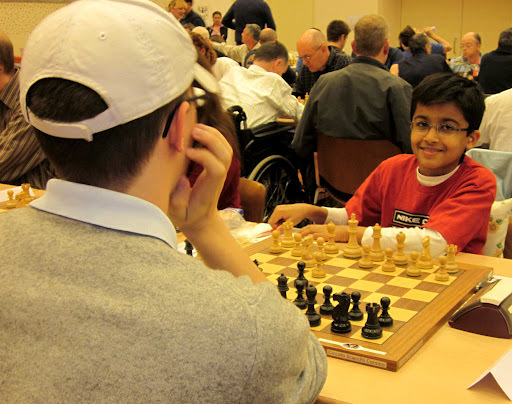 I came 16th overall in the tournament, and also won the U-14 prize. I was happy. 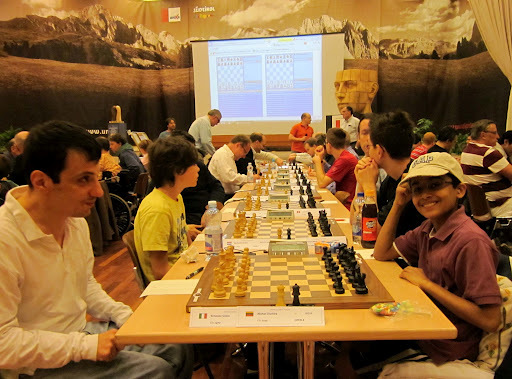 The chess tournament in Ortisei was absolutely fantastic – it was well-organized, professional and the organizers were warm and caring. 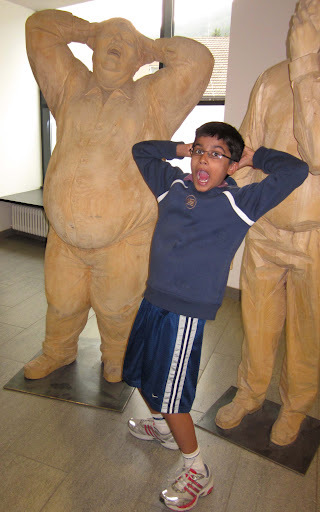 I made many friends. One of them, Ezio, could not speak a word of English (well, maybe “hi”), but he became my biggest cheer leader. Every time he will see me, he will start talking effusively in Italian to me. Full of encouragement and love. What a great guy! For so many reasons, I would love an opportunity to play in Ortisei again. 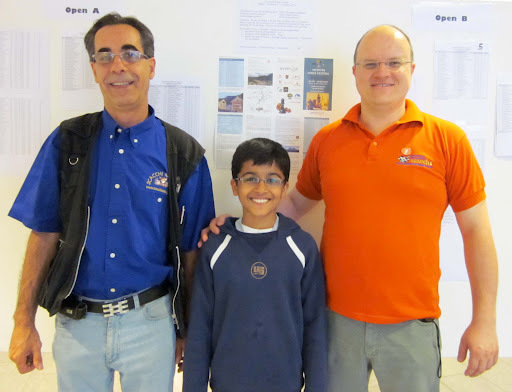 Akshat with Ezio, the technical expert, and Gerhard, our Arbiter. Sharing a Smile with friends Klaus and Ruben. 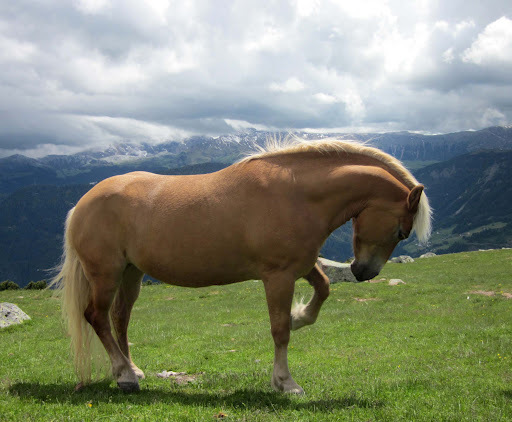 A beautiful herd of horses at an elevation of 2000 meters. Reflecting together! Was e4 the right opening…hmm! Thanks for visiting & I love Italia! 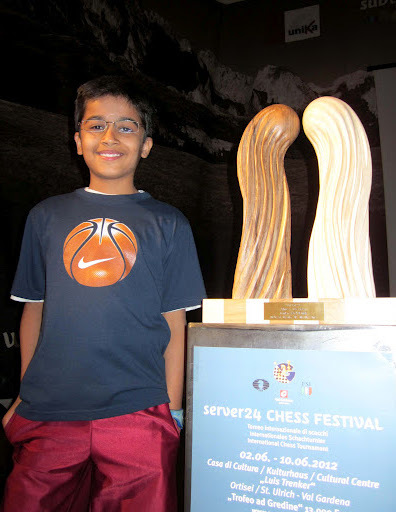 Hello Aksh,I am Giulio Simeone, your 7th round opponent on the Ortisei tournament!! 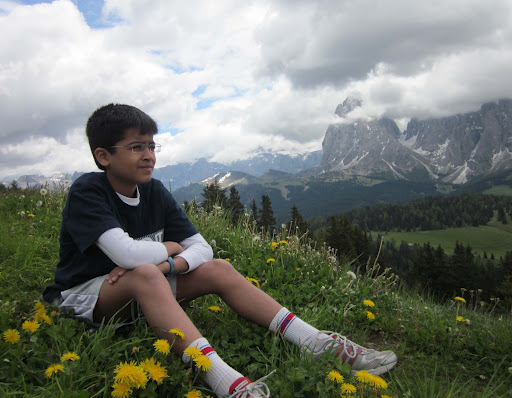 You are right, Ortisei is a beautiful place, I think Trentino Alto Adige is one of the most beautiful regions of Italy, I was there also two weeks ago, I took part to another big international tournament on the Garda Lake. Ezio Montalbini was there, I agree that he is a very good organizer.I have seen that after Ortisei you continued to play all over Europe and to increase your rating, which now is near 2300. 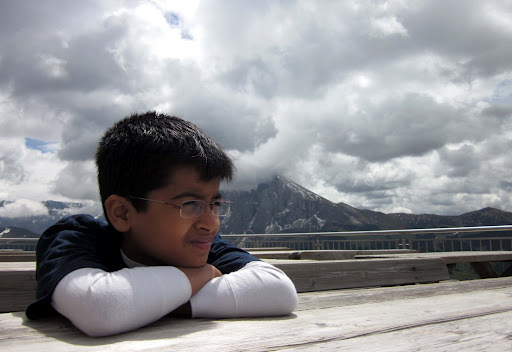 Indeed that's a very high rating for a 13-year-old, surely you are on the good way to become a GrandMaster, maybe you will follow the route of Viswanathan Anand! !One thing, though, I want to say about our game. After the first moves, my pieces were placed better, and I had the chance to take the upper hand with 15. Nd5! Qd8 16. Ne7+. I think you have to give the exchange on that knight: if you don't, I play 17. Rfd1 and it becomes hard for your queen to keep defending the a5 knight. 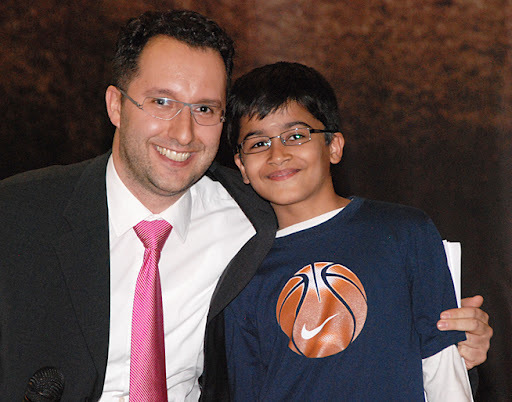 Three moves later, when I let you take the f4 pawn, I undervaluated the weak position of my king and you deservedly won with a smart combination.Best wishes to you and your father, and I hope to see you on Ortisei 2013, they have already registered the tournament on the FIDE website! !